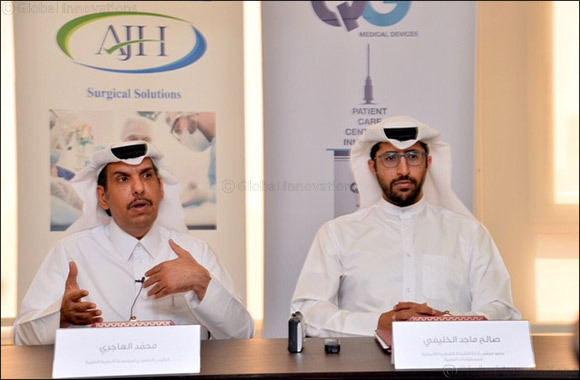 Doha, Qatar, 21 November 2018: Qatari German Company for Medical Devices (QGMD) and Al-Jazira Healthcare group, today signed a cooperation agreement for manufacture of medical devices to be used in Qatar and to meet the needs of the local market. This initiative is in line with Qatar National Vision 2030, which aims at achieving self-sufficiency in this sector. The agreement was signed by Mr. Saleh Majid Al Khulaifi, board member of Qatari German Medical Devices, and Mr. Mohamed Al-Hajiri, Chief executive officer of Al-Jazira Healthcare group. In order to save time and cost in supporting the Qatari product, and to develop synergy between the companies producing medical supplies, it was agreed that Qatari German Medical Devices (QGMD) will be the main company to sterilize all the products of Al-Jazira Healthcare group. It is worth mentioning that QGMD has technical capabilities to provide various sterilization methods and devices such as Ethylene Oxide Sterilizer (ETO Gas) with a capacity of up to 30 cubic meters, in addition to steam sterilizers with capabilities to meet the needs of medical supplies in Qatar. All sterilization tests are conducted inside the factory to ensure that the sterilization process has been done successfully using the most recent methods and international standard. Qatari German Medical Devices has a fully qualified team with high expertise in the field of medical manufacturing. Since its inception in 2007, QGMD manufactures all sort of syringes and needles, and the sterilization process is one of the company’s steps in manufacturing medical products, which makes QGMD an ideal choice in the healthcare industry, and a great support to the medical sector in Qatar.